Read this and other features in Public Health, the Rollins School of Public Health alumni magazine. The Rollins School of Public Health offers master's and doctoral degrees as well as dual-degree programs with medicine, nursing, business, and law. 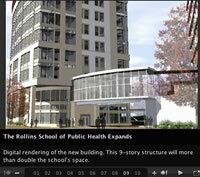 The story of the Rollins School of Public Health and continuing committment of the Rollins family and foundation. Narrated by Dean James Curran.